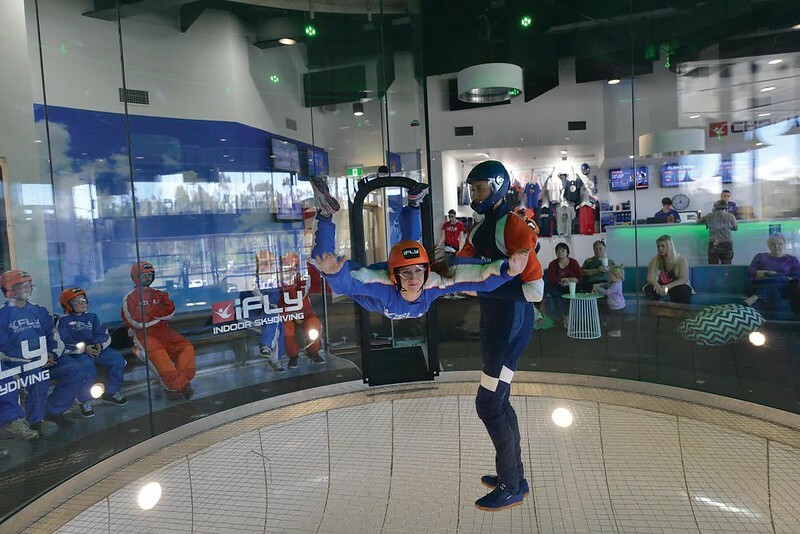 iFly Downunder, Australia’s first indoor skydiving centre, has opened in western Sydney in the grounds of the Penrith Panthers entertainment complex. What’s indoor skydiving? Think of being suspended in a vertical glass tunnel about four metres across, supported only on a cushion of air created by a 250 km/h updraft! 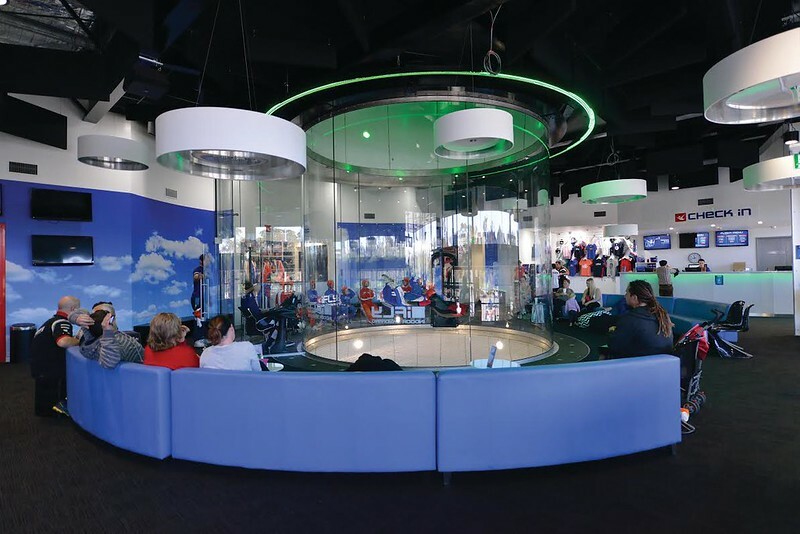 iFly Downunder is the Australian franchisee of a world-wide network stretching from Arizona to Abu Dhabi. The two founders of the Australian venture, Wayne Jones and Danny Hogan, are former special services officers who had trained in similar facilities overseas and saw an opening for both civilian and military use. How does it work? Four massive fans are located in the plant room atop the building. The air flow is drawn by the fans from a plenum chamber in the bottom of the building, up the glass tube, and returned to the basement chamber via the large precast concrete return air towers on each side of the building. Each flight lasts about 50 seconds and is the equivalent to freefalling from about 14,000 feet or just over four kilometres. Although the building design, based on American experience, was originally proposed in steel with metal linings, Glen Balneaves of Raybal Constructions recommended using precast concrete panels for the major structural elements. “I thought it would be cost-effective to go that way,” he says, adding that this has now been adopted in the US. 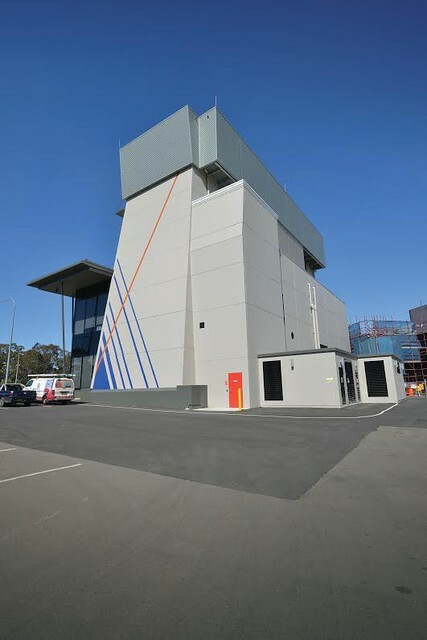 Austral Precast manufactured and installed 119 panels covering just under 2000 square metres, in thicknesses varying from 125 mm to 270 mm. All panels have a class two finish and were painted on site. The majority of panels were used in the massive return air towers on the building’s left and right boundaries, and the lift shaft located near the centre. Precast panels also infill the rear of the building, with the balance of cladding in lightweight construction. For a relatively small building, the engineering and construction were quite complex. The outer elevations of both return air towers are canted which imposes structural loads that are out of vertical. 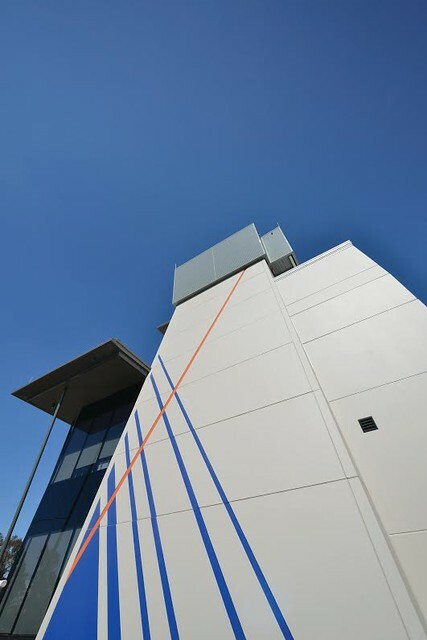 The designers chose to have architectural features scribed into these outer precast panels, which were painted in blue and overstruck by an orange stripe. As well as breaking up the large surface area of the building’s sides, this simple graphic effect further emphasises the centre’s verticality and imparts a distinctive visual branding. Penrith, in Sydney’s outer west, is fast becoming the adventure capital of New South Wales. iFly Downunder shares the Panthers site, now dubbed the Panthers World of Entertainment, with Cables Wake Park. The Whitewater Stadium and Sydney International Regatta Centre are nearby. As well as being popular for “civilian” entertainment from kids to seniors, the centre also has serious applications helping skydivers train for formation jumps (it can accommodate up to 10 participants at a time) and holding closed sessions for military personnel. A cushion of high-velocity air guarantees thrills and a safe, soft landing at iFly. When you specify Austral Precast you are guaranteed the support of Australia’s largest precaster network. They’ll never leave you up in the air!